Nobu Hotel is slated to soft open before the year’s end with additional reservation dates to be announced later this year. 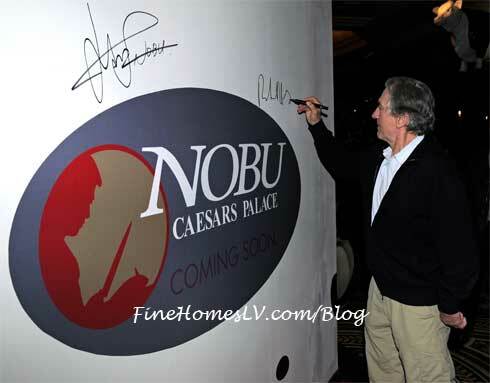 The adjacent Nobu Restaurant and Lounge will be the world’s largest and first on the Las Vegas Strip and is set to open in January 2013. For reservations, visit NobuCaesarsPalace.com or call 1-800-727-4923. Developed in collaboration with Nobu Hospitality and Caesars Palace, Nobu Hotel will lead the way as the first celebrity chef-branded hotel venture. David Rockwell and his firm the Rockwell Group are leading the overall interior design for the boutique hotel, which includes 181 guest rooms and suites. Guest rooms will offer stunning Strip or garden views with designs that embrace comfortable simplicity with natural materials and textures counter-balanced with outsized elements to reveal a touch of Vegas flair. Eighteen luxury suites will range from one-bedroom, 1,000 square feet, to five-bedroom, 3,500 square feet configurations and will be available for guests seeking premium accommodations or a stunning venue to host an unforgettable special event. With its focus on developing a unique sense of style, luxury and craft, Nobu Hotel Caesars Palace will also feature the adjoining Nobu Restaurant and Lounge, spanning 12,775 square feet, which will be the largest Nobu restaurant worldwide and the first on the Las Vegas Strip.